Home » Home Entertainment » DVD/Blu-ray of season one of BORED TO DEATH announced. 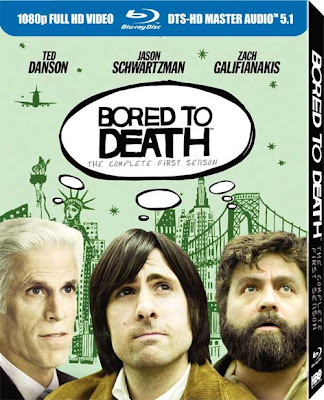 DVD/Blu-ray of season one of BORED TO DEATH announced. HBO has announced that season one of BORED TO DEATH will be released, on DVD and Blu-ray, on Sept 14th. stars Jason Schwartzman, Ted Danson, and Zach Galifianakis. Making of Bored to Death: Go behind-the-scenes of the HBO noir-otic comedy series Bored to Death. Featuring interviews with the cast and crew as well as Jonathan Ames introducing the main characters of the series. Jonathan Ames’s Brooklyn: Brooklyn’s neighborhoods each have their own distinct personality and are a huge part of Bored to Death. Travel into Brooklyn and inside the mind of Jonathan Ames, on a guided tour with Jonathan and Jason Schwartzman to set locations of the first season of Bored to Death. Deleted Scenes: Take a look at some of the hilarious scenes that didn’t make the final cut!